We have the perfect facilities for you to hold a business event- seminar, workshop, training or function for up to 100 attendees. 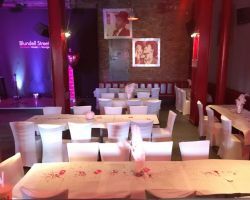 Blundell Street is one of the leading function rooms in Liverpool and Merseyside and we are happy to offer it for a variety of events. 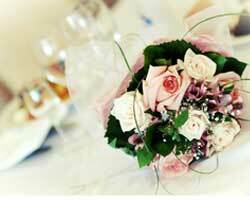 We are very happy to cater for Weddings, Birthday parties and Anniversaries. 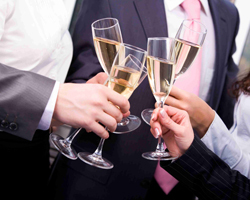 Corporate events are held on a regular basis for business meetings, conferences and training seminars as are sportsman's evenings, charity events and any other event. We offer an atmospheric venue with unique decor. Our Chef and kitchen team offer a wide range of fine food from a small buffet right up to a fully catered wedding function. 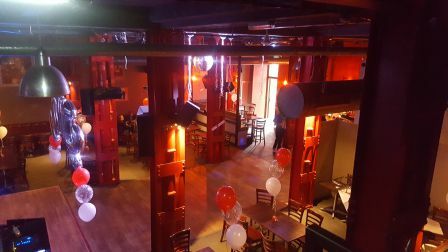 The response we have had from happy customers from all over Liverpool, Merseyside and the North West, tells us that we have created a venue that can accommodate a variety of functions. With our state of the art sound system, dance floor and stage, your party can be a party to remember. The venue can be tailored to your individual budget and specifications. We are also well equipped organisation wise, with a knowledgeable fully trained team so we can assure your private function runs smoothly. FULL VENUE, with or without our catering. IF CATERING FOR 50 OR MORE. £100 IF NOT HAVING OUR CATERING. £300 IF NOT HAVING OUR CATERING. NO PRIVATE HIRE AVAILABLE FOR SATURDAY NIGHT. 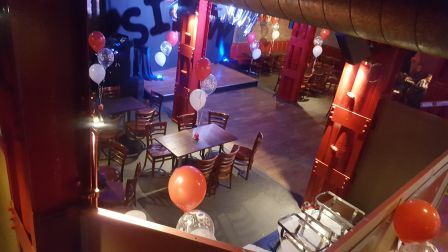 We also have a balcony area available for smaller parties of about 50 people, available for a small charge.